This weekend we had to drive to Orillia, which took us across 89 on our way to the 400. Whenever we go this route, I'm totally blown away when we hit Shelburne and drive through the wind farm there. 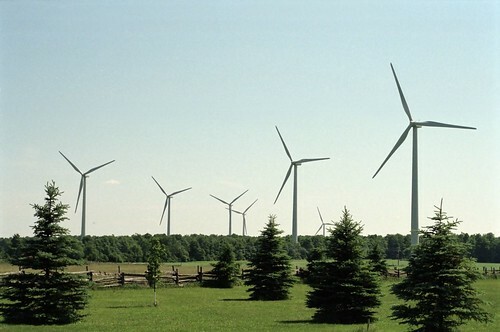 I think there's a tendency in Ontario, especially in Toronto, to think of wind energy as something that might happen some day, but isn't real yet. The pathetic single turbine near downtown Toronto is what a lot of people think of when they think wind energy. Plus... even as governments invest in green technology, some say wind turbines are actually making them sick. We'll air out the arguments over "Wind Turbine Syndrome." I wish I had transcripts or audio to link to here, but since I don't I can't provide direct quotations. However, the show included a discussion of "Wind turbine Syndrome" and rebuttal from a wind energy advocate and lobbyist. I'm not able to comment on the science, or lack thereof, on either side. Some say that the spinning of these massive turbines cause health risks due to low frequency sound and vibration; others deny this. What I do know is that this exchange is a perfect example of what I mean when I say that science is situated. In the past I've made this claim and met with some stunned responses from science's faithful: how could science, which is fundamentally about objective and impartial study, participate in narrative, cultural and historical influence, and show its roots in a given time and place? Throughout both interviews, the term "peer reviewed studies" came up again and again: "Do you have peer reviewed studies to support your claims?" "There are peer reviewed studies that support this..." "No peer reviewed studies could be found..." In essence this preoccupation points to a desire to get at pure science, and put aside discussions that are informed by their participants. I have to hand it to Anna Maria Tremonti, who had no time for the rhetoric being handed to her by the wind engery advocate. He made the point that there is no foundation to the claims of Wind Turbine Syndrome advocates, saying that an independent study had been done by a medical examiner, who found no peer reviewed evidence of harm. Tremonti quickly took this apart, noting that we did a poor job in the past identifying the links between certain cancers and chemicals being used in industry: the lack of peer reviewed evidence is not evidence against, but evidence of the need for more study. Why are these questions not being asked, never mind their outcome? That science gets used this way is alarming, but also not surprising. It is not the results of the studies we do that are troubling: I'd love to know for sure one way or the other, especially as communities around us ponder the use of wind turbines. What I have problems with, and why I don't swallow science whole every time it is handed to me, is that what surrounds this science--what causes questions to be asked, and more importantly, supresses others from being asked at all--is not treated with the same sort of disinterested scrutiny as the questions themselves.